Saint Stephen (detail) by Giacomo Cavedone Saint Stephen was the first martyred saint in the Catholic and Eastern Orthodox churches. Stephen or Steven is a masculine first name, derived from the Greek name Στέφανος (Stéfanos), in turn from the Greek word "στέφανος", meaning "wreath, crown, honour, reward", literally "that which surrounds or encompasses". In ancient Greece, a wreath was given to the winner of a contest (from which the crown, symbol of rulers derived). The use of the noun was first recorded in Homer's Iliad. 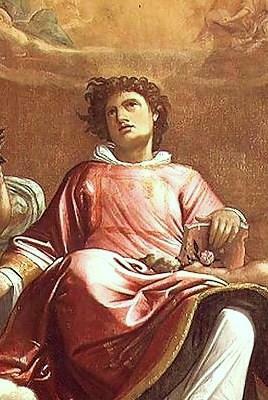 The name is significant to Christians: according to the Book of Acts in the New Testament, Saint Stephen was a deacon who was stoned to death and is regarded as the first Christian martyr. The name has many variants, which include Stephan, Stevan, Stefan and Stevon. In Middle English, the name Stephen or Stephan was pronounced as a bi-syllabic word — Step-hen or Step-han — much like a Scandinavian surname. Steve was pronounced as it is in Modern English. This etymological usage began a decline in the mid-19th century. Steve is the common short form, while various diminutives such as Stevie and Ste are also used. Many family names are derived from Stephen: the most common are Stephens/Stevens and Stephenson/Stevenson (others include Stephen, Stephan, Staphan, Stefan, Stevin and Stever). The name was ranked 201 in the United States in 2009, according to the Social Security Administration. The name reached its peak popularity in 1951 but remained very common through the mid-1990s, when popularity started to decrease in the United States. In the United Kingdom, it peaked during the 1950s and 1960s as one of the top ten male first names (ranking third in 1954) but had fallen to twentieth by 1984 and had fallen out of the top one hundred by 2002. The female version of the name is Stephanie. For Stephen as a surname see Stephen (surname), Stephenson and Stevenson. Note: to find people with the given name Stephen who are also known by another name, see . Stephen Foster (1826–1864), known as the "Father of American music"
Steve Allen (1921–2000), American television personality, musician, composer, comedian, and writer. Steve Irwin (1962–2006), Australian TV personality, nicknamed "The Crocodile Hunter"
Steve Madden (born 1958), Founder and former CEO of Steve Madden Ltd., a footwear company. Stephen, an engine based on Stephenson's Rocket in the TV series Thomas and Friends. The spelling "Stephen" reached its peak of popularity in the United States in the period 1949–1951, when it was the 19th most popular name for newborn boys. It stayed in the top 100 boys' names from 1936 through 2000, and for most years between 1897 and 1921. In 2008 it was the 192nd most common name for boys. The spelling "Steven" reached its peak of popularity in the United States in the period 1955–1961, when it was the 10th most popular name for newborn boys. It stayed in the top 100 boys' names from 1941 through 2007. In 2008 it was the 104th most popular name for boys. Before the 20th century, the "Steven" spelling was heavily outweighed by "Stephen", never reaching above 391st. In England and Wales, neither "Stephen" nor "Steven" was among the top 100 names for newborn boys in 2003–2007. In Scotland, "Steven" and "Stephen" were the 8th and 10th most popular names for newborn boys in 1975, but were not in the top ten in 1900, 1950 or 2000. "Stephen" was 68th in 1900, and 46th in 1950, while "Steven" was not in the top 100 either year. Neither spelling was in the top 100 names for newborn boys in Scotland in 2008. Neither "Stephen" nor "Steven" was among top 25 most popular baby boys' names in Ireland in 2006 or 2007. ^ a b Popular baby names, U.S. Social Security Administration, 2009. ^ Top 100 names for baby boys in England and Wales, National Statistics, 2009. ^ Popular Forenames in Scotland, 1900 – 2000, General Register Office, Scotland, Occasional Paper No. 2, 2001. ^ Table: The Top 100 Names: 1900, in Popular Forenames in Scotland, 1900 – 2000, General Register Office, Scotland, Occasional Paper No. 2, 2001. ^ Table: The Top 100 Names: 1950, in Popular Forenames in Scotland, 1900 – 2000, General Register Office, Scotland, Occasional Paper No. 2, 2001. ^ Table: Top 100 boys' and girls' names, Scotland, 2008, showing changes since 2007, in Popular Forenames — Babies' First Names 2008, General Register Office, Scotland, 2009. ^ Top 25 Babies' Names for Boys, Central Statistics Office Ireland, 2009. István Szabó, Richard Wagner, Glenn Close, Niels Arestrup, Warner Bros.